I went up to Manning, SC on Saturday to meet up with my stitching pals. We had such a blast and you can see lots of pictures on Amy, Faye, and Charlene's blog. We did an ornament exchange and a small gift exchange. I forgot to take a picture of my ornament. 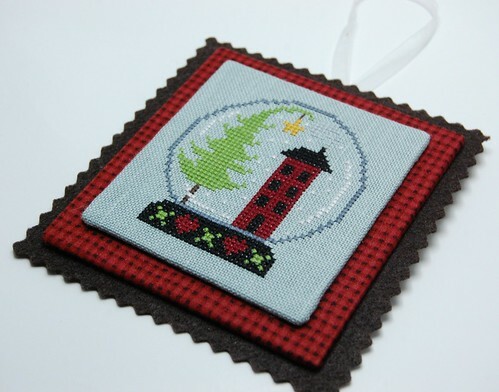 I stitched the bonus pattern from the LHN All is Calm ornament - using Natalie's changes. The ornament I received was Amy's! And speaking of Amy - I got a little bit of stash from DSL the other day. 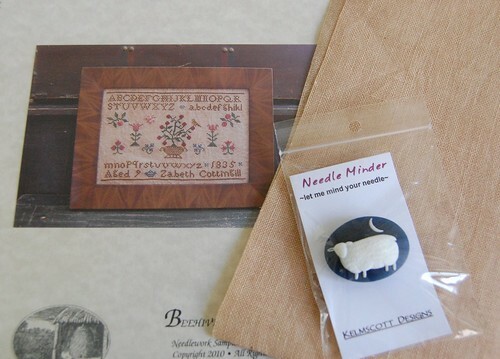 I couldn't resist the new sheepie Kelmscot magnet. I also got some 30 ct. R&R, and a very sweet Repro pattern by Beehive Needleworks. I ended up restarting my "Holly and Ivy Sampler" while up in Manning and I'm so glad I did. I'm really enjoying it! Well, my two older boys are getting ready to start wrestling for the first time tonight. I'm excited and little nervous for them. Maybe I shouldn't go??? :) Write soon! Great ornie and gifts! The start on your SB looks wonderful! 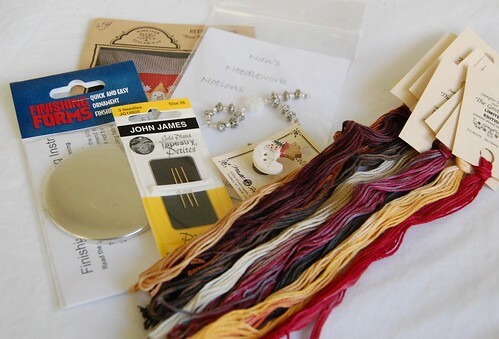 How fun getting together with your stitching pals with the ornament exchange! I love what you received, too. Very nice finishing and I would like to try that style with mine (I have some unfinished ones!). And your WIP is nice as well and it's for Christmas!! Your exchange ornament is cute and it's finished beautifully. It's always wonderful to spend and afternoon with good friends doing the things that we love. Good luck to your boys tonight with wrestling! Sports are always tough for moms. Beautiful ornament and great exchange! Sounds like a fun day! My 7-1/2 year old starts wrestling for the first time tonight too. Hoping all the boys enjoy it! ooooh, nice gifts and great stash! The Holly & Ivy sampler is looking beautiful. I also saw your finish of Belle Pepper - so cute! Love the snowglobe! So cute! I saw the sheepie the other day, and I must say that I am powerless against it. :) It is coming home with me the next time I make a stash run! Your little get together looks like it was fun. :) I saw some pics on Faye's blog. I am nervous for your boys myself! My brothers wrestled all through school...it's not the wrestling that was disturbing, it was the weird fungi they brought home from the floors! EEEEEWWW!! Good luck to your boys in their wrestling endeavors. Glad you got to spend time with you stitching pals. Sounds like everyone had a good day. Glad you had fun time with your stitching friends, Nicole! What nice surprises, too. I've had my eye on the Kelmscott sheep since it was released. Pretty start on Holly & Ivy. I remember the sports years with my DD, soccer, basketball and tennis! It can have you sitting on the edge of your seat, but it's fun. Good luck to your DSs and hope you enjoy their matches! That's a sweet ornament you received! 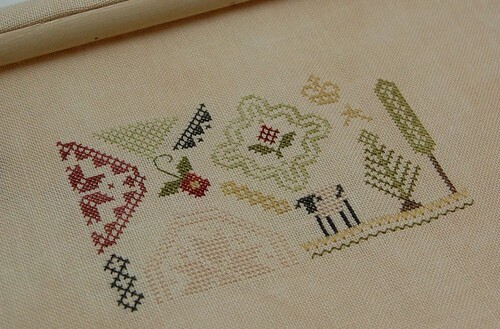 Love your progress on H&I, it's such a pretty sampler! Love the ornament and the gift!! Great new stash too! Hope your boys had fun - you'll have to let us know how the wrestling goes! Cute ornament, fun new stash and I love your Holly and Ivy :-). Love the ornie you received, and you got some wonderful gifts as well. Holly & The Ivy looks wonderful.